With a 129-120 Game 5 win over the Cleveland Cavaliers, The Golden State Warriors are the Champions! Next up…The Championship Parade. 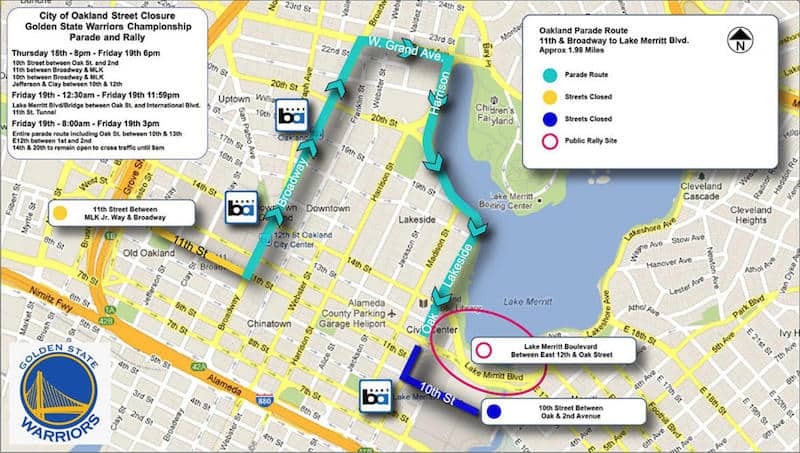 Scheduled to take place on Thursday, June 15 at 10AM, the parade will start in Old Oakland at 11th and Broadway, move north on Broadway, east on Grand Avenue, and then trail south along the west side of Lake Merritt via Harrison & 19th streets before ending up on Lakeside Drive. The Team rally point will be at the Henry J. Kaiser Convention Center on the southwest side of Lake Merritt. If you want get a good spot, make sure to plan on arriving early. Fans can start lining up at 5AM at Lakeshore and 12th Street. There will be a massive number of people going to the parade from all around the Bay Area, so getting there will be a challenge. Luckily, BART has put together a guide(see below) to make things as easy as possible. First, know that BART is going to be crowded like you’ve never seen it before. On the day of the 2015 Warriors parade, BART carried 548,076 people – second only to the 586,061 people who rode BART when the Giants held a victory parade on Halloween 2012. If you’re not going to the celebration and will be taking BART to work or elsewhere, we suggest leaving home early – maybe even before 7 a.m. If you do drive and park, remember that “Permit” spaces are for passengers who have paid for monthly and single day permits in advance. Those without a Permit may only park in the “Fee” areas, which are First-Come/First-Serve. If you park in the “Permit” area without a permit, you are subject to citation. The Lake Merritt Station permit parking lot (located near Laney College) will be CLOSED all day. Don’t be the person stuck in a line for the ticket vending machine while Steph and KD are waving to the crowd. We suggest you buy a Clipper card or ticket at least a day or two in advance. Go to www.clippercard.com and find a retail location closest to you. If for some reason you don’t, BART will be selling $15 Clipper cards at special cash-only ticket tables at the stations listed below. We picked these stations because they had long lines in 2015. Be sure to keep these Clipper cards and register them. They work on other Bay Area transit. The Lake Merritt BART Station will be in the epicenter of the celebration so it’s best to avoid it. We strongly suggest taking BART to either 12th Street or 19th Street stations in Oakland. They are bigger and they’re right along the parade route so you’ll have more elbow room. They will also be your best options for starting your trip home. Trains coming from Dublin/Pleasanton and Fremont Warm Springs towards Oakland may skip Lake Merritt after 8:30am if the rally zone has reached capacity and has closed or if the station becomes too crowded. Listen to announcements and use 12th or 19th street instead. The Pittsburg/Bay Point morning service WILL NOT match the regular published schedule. Some trains will be rerouted to other crowded areas in the system. After 8 am every other train from the Warm Springs to Daly City line will not go to San Francisco and instead go to Downtown Oakland to serve the parade route. These trains will terminate at MacArthur Station. Finally, it probably goes without saying but we’ll say it anyway: smile and have fun. We at BART enjoy serving you on what should be a joyous and memorable day. We only ask that you show common courtesy to your fellow riders, follow our simple rules and -if you start to get a little impatient- think about the folks in Cleveland who wish they had a parade.